I love a good beef rib. The marbling of the fat is more consistent than with brisket and overall flavor I compare to a combination of both the point and flat sides of the brisket. I also have recommended it to some newbies as a crossover meat to bring them to the point (fatty) side of brisket. A poorly trimmed rib can have a high amount of fat, but properly trimmed it is the pinnacle of smoked meats. There are two commonly sold cuts of beef ribs; the ‘plate’ ribs which run 1.5 pounds to 2 pounds per bone, and chuck ribs which generally run a half to three quarter pound each. I’ve covered the ‘true’ costs of this meat with the bone weight factored and a beef rib will cost you more than brisket in edible weight, but they are a treat for sure. Sticker shock can easily set in with a plate rib if it’s added to an order of other smoked meats and sides, and I usually do not recommend tackling even a single plate rib with a side by a single person. This adds to the myth of barbecue being expensive because it is easy to over-order. Dropping $35 and more for a single item on a plate of food can be an eye opening experience, but the selfie value of posing with a “dinosaur” rib or “flintstones” rib is there for some. Chuck ribs provide a good alternative to their larger brother. I do believe the flavor of the plate rib is superior, but the chuck comes in a close second. It’s also a great way to add on to a plate of food for a smaller group or budget. They are much less popular then the larger ribs at restaurants, and I have rarely found them in Austin where the traditions of Louie Mueller and Black’s giant ribs combine with a high ratio of Millennials who’s dining out budgets are much higher than other generations. Unlike brisket and some other meats served in barbecue but similar to pork ribs, a beef rib is priced with the bone included. That does make the pricing a bit misleading, and this article I wrote goes into detail regarding the same. In short, that giant bone costs you about $8 – but it also costs the restaurant too so don’t go complaining. The bone also does play a factor in chuck ribs, and when comparing I found that the bone will cost you around $2 on a half pound rib, assuming pricing at $15 a pound. Chuck ribs are generally priced lower than plate ribs. This nets back up to around $19 a pound based again on that $15 a pound price base when you remove the bone. One of the great things about the Houston area barbecue scene is that the pricing is not as high as Austin. 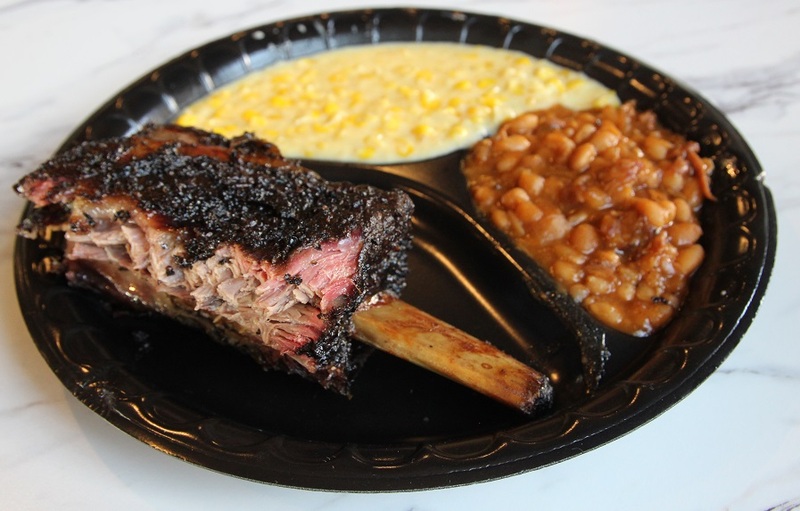 Dining out and about in the Houston area I found several great value options for enjoying a beef rib while not needing to pawn your false teeth or take out car title loan. Two involve the chuck rib, and currently there is an excellent option for enjoying that giant dino rib with a great price. Psst. Can we keep this a bit of a secret? Corkscrew sells their beef ribs by the whole rib, not by the pound. We’re not talking the smaller chuck ribs,either, they serve the full-size full-flavor plate ribs.The ribs are only available on Saturdays for now. If you’ve been to Corkscrew’s brick and mortar location you might have noticed how efficient their line is. If you haven’t then get out there right away. I’ve been to hundreds of barbecue joints and they are at the very top of efficiency. two and sometimes more cashiers take your order and pick up is only a few minute wait after that. Owners Will and Nicole Buckman have worked hard on making the line not a part of the experience and it shows. Accuracy here is also emphasized and not only do the cashiers read your order back to you line by line, they ask you to initial approval of the order. I am impressed every time I come, and the beef rib pricing is part of their efficiency efforts. Since they are regularly priced by the pound, a beef rib must be cut and weighed before purchase so ordering one can slow the line movement. To combat this Corkscrew is giving the benefit to the customer and selling ribs for a flat rate of $20. That’s a $30-$35 value easily, and a most incredible value. Take advantage before the Buckman’s come to their senses but thank them both for the value and the expediency of service. Yes you read that right. First up if you haven’t yet, please take a minute to read my interview and discussion of beef ribs at Spring Creek from 2014. Spring Creek is a family owned chain. They don’t like to use that term as each location is family owned but with a large number of locations it is hard to otherwise describe. It is definitely not a franchise and there is family pride across the business. Ellis Dyson had an epiphany after attending barbecue camp and completing a road trip to some of the highest ranked joints in Texas. They began changing their rubs and styles of cooking and are striving to move beyond average barbecue into the realm of good quality and high availability. 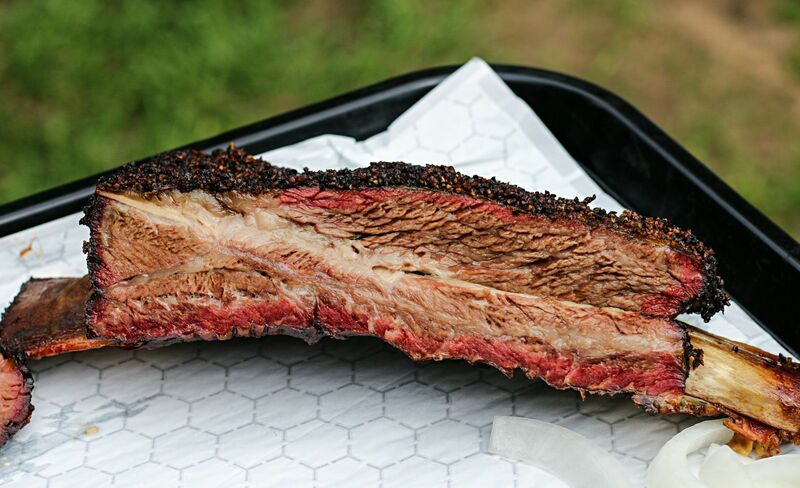 To this point they have begun rolling out beef ribs at their locations. These ribs are coated thick with pepper unlike any chain and cooked with care. The ribs may not get the maximum amount of smoke that a 100% wood smoker can provide, but they have dialed down the gas and are truly trying to provide a competitive product. I’m not going to lie to you and say they are on the same level as the top five barbecue joints in Texas, but its a respectable product and the beef rib in particular I have enjoyed on multiple occasions. But here is the kicker, these babies are priced at $12.95 per pound. This means a chuck rib will run you between $7-$10. This is a much more reasonable addition to a barbecue meal than the $30 or more than a normal sized and priced plate rib will extract from your wallet. Note that they do not have these at all locations. They started at one of their showcase locations in Katy and I most recently had one in Cypress. Dallas area locations my take longer but call your local location to request. 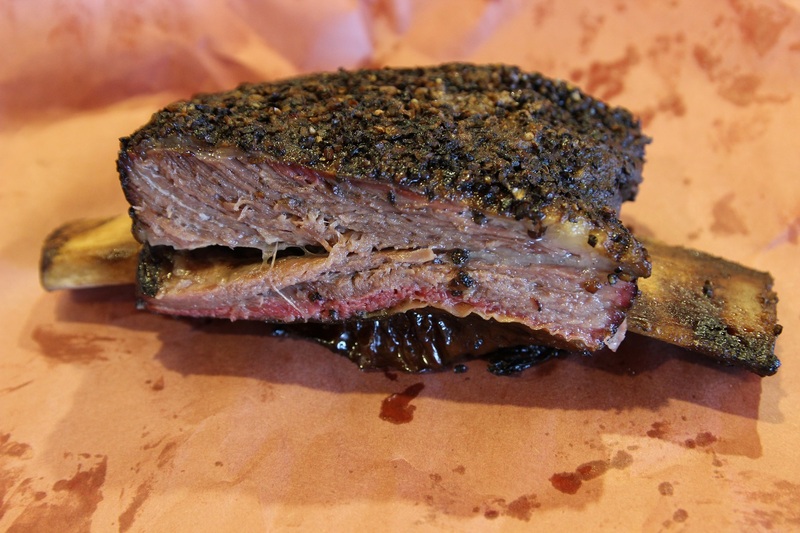 Killen’s barbecue landed on the scene intently focused on providing top tier barbecue. Relentless effort and tweaking backed by Ronnie Killen’s culinary training and the highest quality meat sources made them a near instant hit and a top five ranking. The sides and desserts at Killen’s are exemplary, but the meats are the star. With a wide menu of quality options a visit here can drain a wallet quickly; It’s not that the pricing is poor, Killen’s prices are at or very close to most similar joints and less than a number of their counterparts, but when you order a 5 meat plate, a large plate rib, and desserts you might not be prepared to see all of that totaled up onto one ticket.